Tortang Halaan is actually clam omelette but the added steps are putting the halaan omelette in banana leaves and then fried. 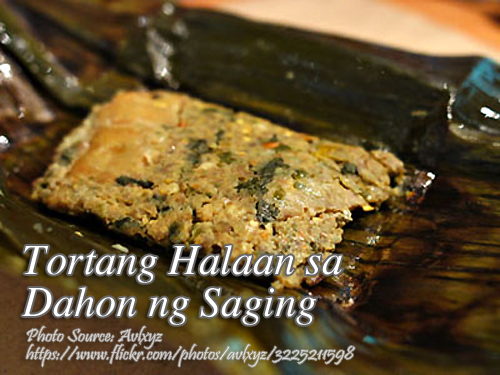 The banana leaves gives savory flavor and aroma to cooked dishes. To cook tortang halaan sa dahon ng saging; Soak clams in water with 1 Tbsp salt for a few hours. In a pot, boil some water and drop the halaan or clams until they are half opened. Cool and drain then remove the meat from the shell. Then chop the meat finely and transfer to a bowl then add the beaten eggs. Set aside. In a saucepan heat oil then saute garlic until light brown. Add in the onions and tomatoes until soft. Then add the clam meat-beaten egg mixture and season with salt and pepper. Stir cook for a few minutes until the omelet solidify.